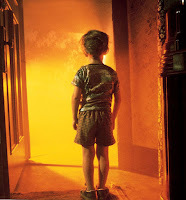 I take a look back at one of my all time favourites, Close Encounters of the Third Kind. There are three movies that are always in my mind when someone asks me what my all time favourite movies are. Jaws is always there along with Raiders of the Lost Ark and of course Close Encounters of the Third Kind. Like Jaws this is a perfect Spielberg film with some of the most iconic scenes in cinema history. Classic Spielberg directing, an incredible John Williams soundtrack and a cast who nail every scene make this easily one of my all time favourite movies. As a Spielberg fan it has two of my favourite scenes from the director. The first time Roy witnesses the UFOs in his van. In particular there is one simple shot around 19m 55s in where you see a van moving across a road at night with trees silhouetted by the starry night sky. 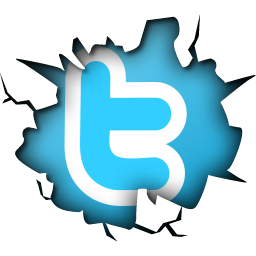 A slow moving UFO moves across the screen. I love this shot and for me this is a classic Spielberg shot. glow filling the screen with Barry looking on is pure cinema gold. In 1990 to select a single "master image" that summed up his film career, Spielberg chose that shot. He said "That was beautiful but awful light, just like fire coming through the doorway. [Barry's] very small, and it's a very large door, and there's a lot of promise or danger outside that door." A good movie never ages and this certainly applies to this classic. Released in 1977, the same year as Star Wars it gained Spielberg a best director’s Oscar nomination ultimately losing to Woody Allen for Annie Hall. 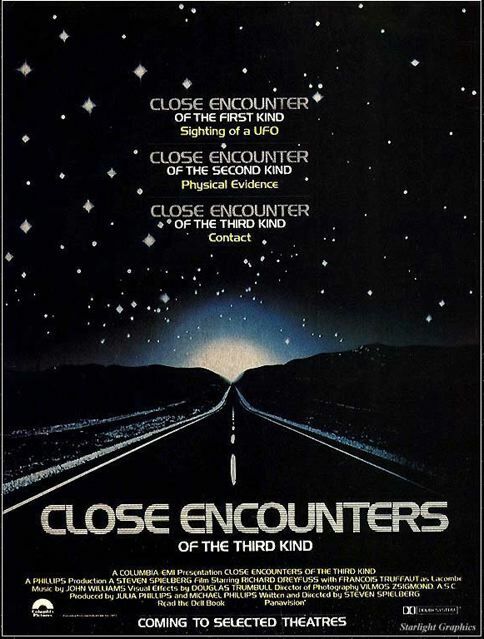 The estimated budget for Close Encounters was around $19 million and grossed $128 million in the US alone. It literally saved Columbia pictures who were close to bankruptcy at the time. In his original pitch to the studio in 1973 Spielberg said it would cost $2.7 million to make. Later the studio said if they knew then it would cost $19 million to make they would have said no simply because they didn't have the money at the time. Spielberg went on to do one other movie with Columbia which of course was 1941 co-produced with Universal. Columbia could have made a lot more money with Spielberg as they famously turned down E.T. The Extra Terrestrial. 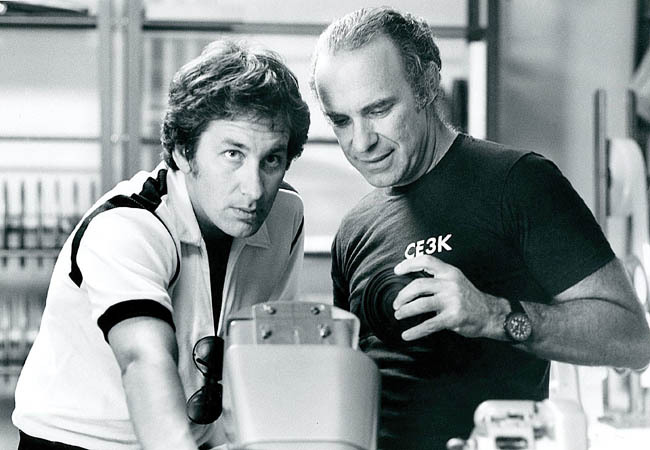 It’s worth noting that Close Encounters saw the first collaboration between editor Michael Khan and Steven Spielberg which continues to this day. Spielberg would later go on to say that the last 25 minutes of Close Encounters was one of the hardest they've ever had to edit. Now we can’t talk about Close Encounters without talking about John Williams and his famous score. It is one of his finest and his five tone signature piece has become an instant recognisable piece all over the world. He went through three hundred versions before settling on the piece we know today. He wanted a five note piece that ended on an up note so it left you feeling curious. Kind of when you ask a question. He was nominated for an Oscar for his work on Close Encounters but lost out to Star Wars which of course he probably didn't mind as that was his work too. The whole of Close Encounters builds up to the ultimate and unforgettable last half hour where we finally meet the aliens. The mother ship which was designed by the legend Ralph Mcquarrie and which Spielberg said he had inspiration from the look of an Oil refinery in India descends on Devils Tower. Communicating through music the hatch opens on the ship and we see for the first time almost at the end of the movie the aliens for the first time. For me that’s incredible. A film about UFOs and aliens and you don’t see the aliens until the end. Would that happen in today's movies? It’s so easy to say they don’t make films like this anymore but in this case it’s true. For me Close Encounters is not an alien movie but, its more about the people. about how they react in extraordinary situations and ultimately reacting on our calling in life. 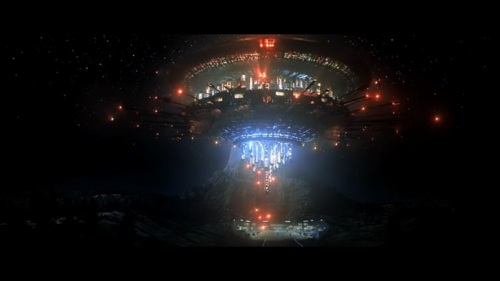 In 1997 Close Encounters was deemed "culturally and historically significant" by the United States Library of Congress, and was added to the National Film Registry for preservation. 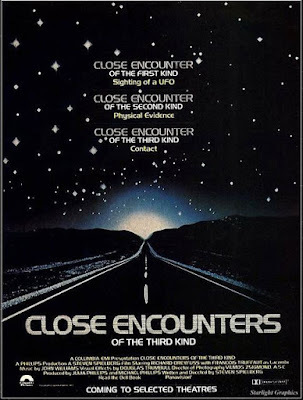 Close Encounters deserves to be a called a classic. One final thing, I thought it would be fun to point out a few bloopers. One in particular. It’s about 1 hour 4 minutes and 8 seconds in on the Special Edition version of the movie. When Roy and Ronnie argue in their bedroom, Toby closes his bedroom door. Just before he closes the door, you can faintly hear Steven Spielberg saying, "Close the door now." Worth checking out. I checked it our recently on the Blu-ray and it’s still there. Close Encounters of the Third Kind is a perfect example of a classic Steven Spielberg movie and a timeless classic.